Ireland became a member of the European Union on 1 January 1973, but the foundation of the country’s links with Belgium and Europe was laid down hundreds of years earlier. In 1607, a group of Franciscan monks, fleeing persecution in Ireland, established the Irish College in Leuven. With the support of Archduke Albert and his wife Isabella, the college became an important centre politically, economically and intellectually; decisions made here were felt throughout Europe. 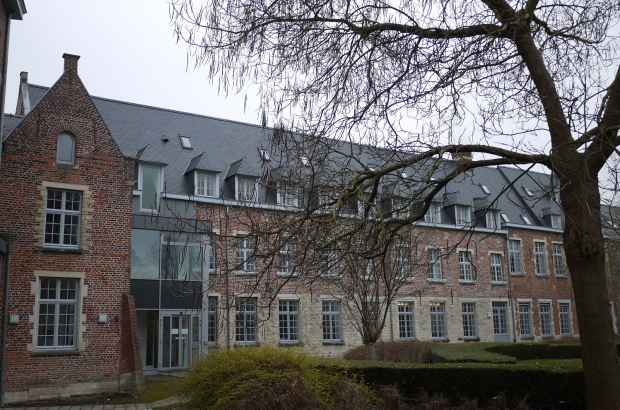 Today, the college is run and maintained by the Leuven Institute for Ireland in Europe. The institute was formed in 1984. “Today our mission is to develop and deliver bespoke programmes to clients from Ireland and Northern Ireland and to maintain and manage high-quality accommodation and conference facilities,” says Geary. The institute is managed by a board of directors, with members coming from Northern Ireland, the Republic of Ireland and Belgium. It operates as a non-profit organisation, with offices in Dublin and Belfast, where the staff meet with clients to discuss potential programmes. These range from a visit to the European Parliament and Commission in Brussels, inviting speakers from the University of Leuven (KU Leuven) to give lectures, or visiting companies and other commercial enterprises in the area. Programmes can also be more heritage-oriented, such as a guided coach tour of major First World War sites in West Flanders, including the Island of Ireland Peace Park, the In Flanders Fields Museum and the Menin Gate. “We also have a commercial aspect, where clients like KU Leuven make use of our facilities,” explains Geary. The institute also serves “as a hub for the promotion of Irish culture,” she says, by accommodating and supporting the Leuven Centre for Irish Studies and the European Federation of Associations and Centres for Irish Studies (EFACIS), both of which have their offices there. The Leuven Centre for Irish Studies works closely with researchers from Irish universities on topics relating to Ireland. The aim of EFACIS, on the other hand, is to promote and support studies in all aspects of Irish society, culture and literature throughout Ireland. Many clients return annually. Trinity College Dublin, for example, brings its business students every year for the European Residency Week, while undergraduate students in European Studies at Maynooth University come on a week-long study visit. The institute also works with universities in the US, including in Boston and Chicago. The facilities include four conference rooms, 59 bedrooms and a dining hall with a garden terrace. There is also a residential bar and a multi-purpose auditorium with retractable seats. Accommodation and catering choices are planned according to the clients’ needs, and all facilities are wheelchair-accessible. The institute is also open to the public.